Felix Neureuther of Germany won the slalom on Friday in the Hahnenkamm event. KITZBUEHEL, Austria — Felix Neureuther of Germany won the slalom of the classic Hahnenkamm event in heavy snow on Friday in a repeat of his first World Cup victory here four years ago. Neureuther triumphed in front of 22,000 spectators after first-run leader Marcel Hirscher failed to finish. The defending overall champion from Austria led Neureuther by 0.38 seconds after the first run but straddled a gate in the second. "It’s always special to win here. This is one of the big classics," Neureuther said. "Today it was really extreme. Marcel’s exit is a bummer, he was skiing fast. But I’ve had my fair share of mistakes as well." It was Neureuther’s third win of the season and eighth overall. His second win in Kitzbuehel came 35 years after his father Christian also won here. Neureuther avoided mistakes in his second run and finished in 1 minute, 53.23 seconds. Henrik Kristoffersen of Norway was 0.57 back in second, and Patrick Thaler of Italy finished third, 0.82 behind Neureuther. As the final racer on the course, Hirscher initially extended his lead over the German to 0.40 before one of his skis went past a gate on the wrong side. "You can tell by the split times that I was taking risks. I was really fast," Hirscher said. "It really annoys me it had to happen here in Kitzbuehel. Why not somewhere else?" Hirscher remained top of the slalom standings with 340 points, with second-place Neureuther closing the gap to 30 points. Hirscher is aiming to become the first slalom skier to win back-to-back crystal globes since fellow Austrian Thomas Sykora in 1997 and `98. However, Hirscher failed to overtake Aksel Lund Svindal at the top of the overall standings. The Norwegian could even extend his 22-point lead in a downhill on Saturday that Hirscher is skipping. Weather conditions were expected to improve for the downhill on the Streif course. Alexis Pinturault of France, who won the slalom in Wengen last week, finished 1.05 behind in fourth. Switzerland’s Luca Aerni, who was third after the opening run, dropped to fifth, 1.10 off the lead. Daniel Yule of Switzerland, who was 30th after the opening leg, posted the fastest second-run time and finished seventh for his best career World Cup result. It was the final slalom before nations have to name their Alpine skiing teams for the Sochi Olympics. Hirscher and Neureuther were set for a 1-2 finish after the opening run as the rest of the field was at least 1.26 behind the Austrian. "Visibility was obviously bad," said Hirscher, who wiped his goggles immediately after crossing the finish line in his first run. After days of mild weather, course workers salted the piste in order to harden up the surface, but the fresh snow made for difficult conditions. Furthermore, the unusual placing of some gates by Croatian coach Ante Kostelic made racing even harder. Kostelic, the father of former overall champions Ivica and Janica, has made a name for setting challenging courses. A year ago in Kitzbuehel, the jury rejected a course set by Kostelic, deeming it as "unskiable." 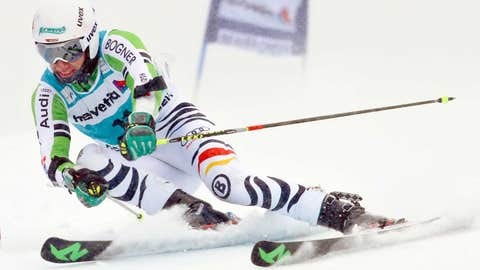 The course wasn’t that extraordinary this time, though Neureuther said it was "by far the most difficult slalom in Kitzbuehel I have ever done." "Visibility is brutal, the course setting is extreme, and the piste is bad," the German said. "It’s extreme but we are the best ski racers so we have to adapt to these conditions." Nolan Kasper of the United States lost a pole when he tried to clean his goggles during the final part of his first run. He still completed the final gates. "It’s definitely tough, it’s one or two gates in a row that get a lot of splashback," said Kasper, who finished 2.29 back in 18th for his best result of the season. "It’s not the snow falling, it’s the snow from the gate. That’s why I tried to wipe my goggles and dropped my pole." Fellow American Ted Ligety placed 15th, 2.16 off the pace. The next slalom on the men’s World Cup circuit is the annual night race in Schladming on Tuesday.